Skiing conditions on venue hosting the Golden Fox in a couple of weeks are amazing! However, organizers are not completely calm expecting snow controller Markus Maier on 23. January. 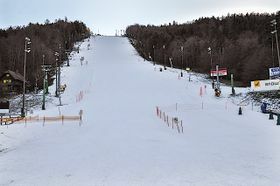 At this moment, skiing to the valley is open for recreational skiers and chances of welcoming men's and women's Slovenian national team on Snežni stadion are still open. Organizers are staying on watch for upcoming weather forecast.